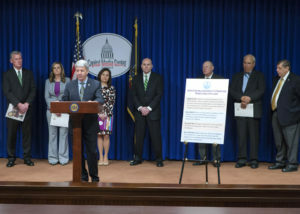 Seeking to strengthen and reform Pennsylvania’s domestic violence laws, a group of Pennsylvania senators today unveiled four bills designed to offer greater protections to victims of domestic violence and their children, as well as hold abusers accountable. Senators Tom Killion (R-9), Randy Vulakovich (R-38), Tom McGarrigle (R-26) and Camera Bartolotta (R-46) joined representatives of law enforcement and the Pennsylvania Coalition Against Domestic Violence at a news conference at the state capitol to outline the reform measures, which were developed with input from district attorneys, domestic violence experts and others who have an interest in improving the judicial system’s ability to protect victims. Last year, Pennsylvania assisted more than 89,000 victims of domestic violence.